From left to right and top to bottom: Sukhrob Kamolov, Romain Charles, Diego Urbina, Wang Yue, Alexey Sitev, Alexandr Smoleevskiy, Mikhail Sinelnikov Press conference on the announcement of the crew of 520-day isolation. Scientists in Russia launched an ambitious Mars spaceflightsimulation Thursday ? one that will lock six volunteers away for arecord-setting 520 days to practice every step of a mission to the red planetwithout ever leaving Earth. The Mars500project, a joint experiment by Russia, the European Space Agency and China,began at 5:49 a.m. EDT (0949 GMT) as the hatches to the mock Mars spaceship wereshut at Russia's Institute for Biomedical Problems (IBMP) in Moscow. ThreeRussians, two Europeans and one Chinese volunteer make up the experiment'ssix-man crew. "Goodbye Sun, goodbye Earth, we are leaving for Mars! "wrote French engineer Romain Charles, one of ESA's two crewmembers in the simulation,in a mission diary on Wednesday. Charles is locked in the Mars500 simulator with fellowEuropean Diego Urbina, Russian engineers Alexei Sitev and Mikhail Sinelnikov,surgeon Sukhrob Kamolov and physiologist Alexander Smoleevsky. Chineseastronaut trainer Wang Yue rounds out the crew. One of the Russians serves as a backup for the six men inside the simulator. "The internationalism of Mars500 does not onlyinvolve the crew, but also the researchers who come from so many countries thatI could easily surpass the word limit in this blog post," wrote Urbina, anItalian engineer, wrote in a mission diary post. "This is for sure astrong point of Mars500, as no human flight to the Red Planet will be possibleby one single nation." Each of the volunteers will earn about $99,000 for theirparticipation in the 18-month endurance trial, which will simulate the 250-day flight toMars, a landing and surface stay of up to 30 days, and then the 240-daytrip back to Earth. This Mars500 project follows shorter 105-day and 14-day simulationsin the same Mars spaceship simulator in 2009. If successful, it will be thelongest high-fidelity spaceflight simulation in history, outlasting the real six-and seven-month missions by astronauts and cosmonauts to the International SpaceStation. The longest any human has spent in space on a singlemission is 438 days, a record set in 1995 by Russian cosmonaut Valery Polyakov onthe Mir space station. But if Russia, NASA and their international partnershope to one day send human explorers to Mars ? a goal set in the United Statesby President Barack Obama in April ? much longer missions will be needed. "The duration of the mission and its focus on behavioraland physiological issues is really the benefit of this study," American researcherDavid Dinges, a psychology professor at the University of Pennsylvania. Dinges is leading the only American study attached to theinternational Mars500 project, an $800,000 investigation for the National SpaceBiomedical Research Institute (NSBRI) to study the psychological effects of ultralong-duration isolation. 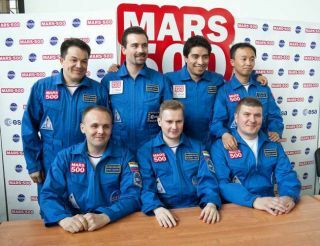 In all, some 100 experiments are planned for theMars500 crew during their mission. There are no windows in the Mars500 simulator and allcommunications will be routed through a simulated Mission Control that plans toreplicate the 20-minute lag between signals crossing the gulf between Mars andEarth. "The confinement and isolation and the time lag are verymuch like what we'll be experiencing with a tripto Mars," Dinges told SPACE.com before heading to Moscow for today'shatch-closing. "Our focus is on stability of attention and measure ofperformance." The Mars500 experiment's mock Mars ship contains about2,152 square-feet (200 square-meters) of space. It is equipped with a medicaland scientific research area, living quarters, kitchen, greenhouse, andexercise area. A simulated Mars landscape, Mars base and landing vehicle arealso included, along with vital facilities like bathrooms and other essentials. But while large, the Mars mission simulator is far from palatial,though some modules are lined with wood paneling to increase crew comfort. "It is very much like three or four Winnebagosconnected by tunnels that you crawl through," Dinges said. "I thinkthe Russians did, in fact, do a very good job" recreating the conditionsof a Mars spaceship, he added. The Mars500 crew, like real-life astronauts, will haveeight-hour work days, with the rest of each day split for equal amounts of freetime and sleep. The volunteers will have weekends off, but must exercisetwo hours a day like space station astronauts. They will only get to showeronce a week. "The physiological aspects of the experiments arealso of great interest," ESA officials said in a statement. "Theirbodies will start to adapt to new conditions ? a closed environment withrestricted space can quickly lead to poor physical condition." One of ESA's experiments calls on the Mars500 crew to play tailored video gamesto study the potential for electronic assistants for astronauts onlong-duration crews. The games will be played once every two weeks by threecrewmates at a time, and include a multi-player cooperative game, asingle-player lunar lander simulation and a collaborative training systemscenario, ESA officials said. Scientists from all of the studies planned during theMars500 mission are eager to see the results, but there is still someuncertainty into how it will turn out. The Irish online betting service PaddyPower is already taking bets for which crewmember will quit the simulationfirst. "It's hard to know what will happen," Dingessaid. "I'm just hoping that the crew will be able to complete themission."